Published by Longman Paul, Auckland, 1994, 433 pages. This book looks at what is probably the most dramatic period in the history of our country - the arrival of the second great migration of people and their clash with the descendants of the first great migration as they strove to build a life for themselves and their families. The changing economic, social and political scenes throughout the century are given detailed and balanced coverage. 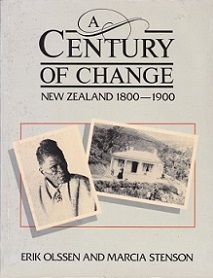 Both the serious hisotry student and the curious lay person will find 'A Century of Change' a fascinating, informative and lively account of the people and events that have helped shape present New Zealand society.